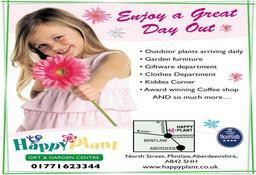 We began life in 1984 and now we are the largest Gifts and Garden Centre in the North East of Scotland and a 4-Star Scottish Tourist Board Garden Centre. 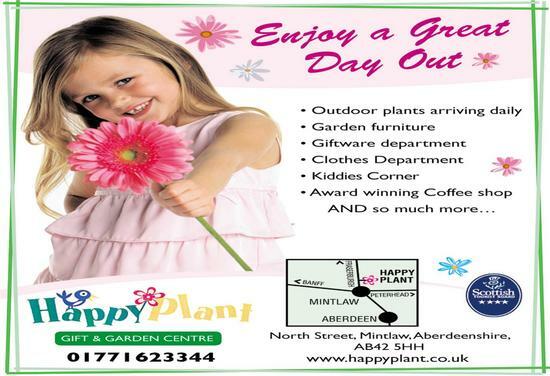 Nestling in the Buchan village of Mintlaw, only a mile to Aden Country Park, a visit to The Happy Plant Gift and Garden Centre - renowned for its quality products and service - is an absolute must. Our large parking area has ample space for both cars and coaches. You will find it a pleasure to wander through our spacious garden and gift departments - then drop in past our award winning Coffee Shop. In order to be of assistance to our disabled customers there are disabled car parking spaces close to the store entrance and the doors are automatic opening. Spacious disabled toilet facilities are also available, complete with easy grip rails and an emergency call button. Customer toilets and nappy changing facilities are provided on-site.